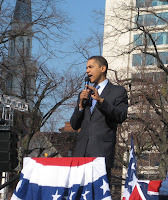 On February 3rd 2008, I can say I witnessed history and knew that change was coming. I was standing in line at Barack Obama's rally in Wilmington, Delaware, with my friend Ryan Silberstein, when he turned to me and asked me who I would vote for if I voted in the Democratic primary. When I told him I was undecided, he pressed me further and asked me who I was leaning towards and I told him Barack Obama. What was holding me back? I knew that Hillary was the "safe" choice for Democrats, she would more than likely cruise to victory over McCain and had as good a shot as any to be a two-term president. Barack Obama was a risk. He was inspiring and charismatic but I worried about what other people would think about a black candidate and if he really had the fighting spirit to defeat a Republican attack that would be blistering without mercy. To his critics he was inexperienced, hope mongering, and a celebrity to boot. Hearing Obama speak tonight made me proud of my choice and proud of Barack for the long journey he has taken over his life to come to this spot. For someone who could have made millions on Wall St. to go back to the community, provide service to his county and then be called a "celebrity" is absolutely mind boggling to me. Tonight Obama was grounded, sincere, inspirational and humble. I don't know if Obama will win the presidency but he has won over my mind and my heart. The late Tim Russert once said the American people rarely get it wrong when making the paramount decision of electing their president. I wholeheartedly agree with Russert and know that after all the ballots have been cast in November, the American people, the greatest nation on the face of the earth, are not going to get this one wrong either.